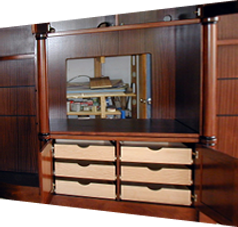 Is cabinetry a work of art? 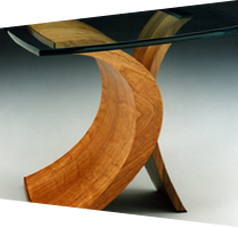 Contemporary wood furniture from Rapaport Designs possesses the impact of works of modern art. 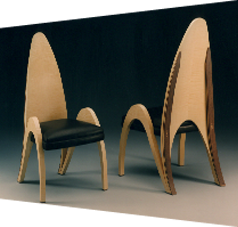 In Mason Rapaport's hands, Italian Poplar and Finnish Birch veneer bends into uniquely graceful, yet dynamic shapes. 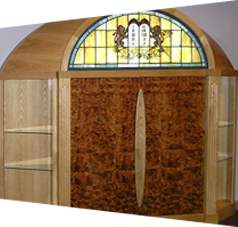 Given a place in your home, this fine furniture will become tomorrow's hand-crafted heirloom. 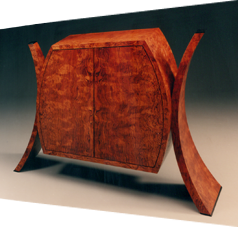 Commission new furniture for your dining room, living room, or library, and create a room with one-of-a-kind ambiance. Rapaport Designs can build both a dining room table and the dining chairs to surround it. Bedrooms come alive with the sight of luxurious wood grains. Family rooms shed traditionally boring appearance and, instead, display a witty, delightful personality. 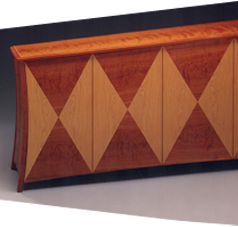 Discover the marriage of functional and eye-catching in a credenza, buffet, or china cabinet.